You've heard it time and again: "Be careful what you wish for." 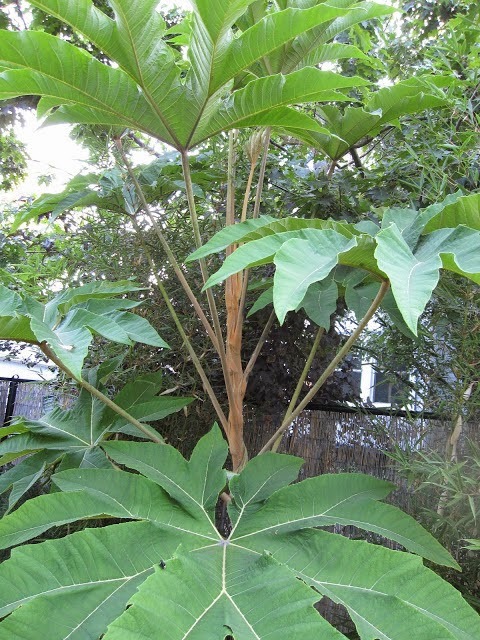 Since planting Tetrapanax papyrifer 'Steroidal Giant' in the spring of 2011, I've been obsessively watching and hoping for it to sucker and make babies. Well, this is the year that I have babies! Lots of babies. Some of these "babies" have larger leaves than the mother plant that died back during our harsh winter. So far, I have counted 14 babies, though several perished when I tried to pot them up earlier this spring. I checked with Burl Mostel, of Rare Plant Research, who told me he has his best luck digging and potting the youngsters in winter. I had one apparent success at potting, probably because I dug a sizable baby and took a lot of soil with it. As we know, volunteers rarely locate themselves in the spot you'd have chosen for them, and I have already removed a few Tetra babies that were too close to other plants. 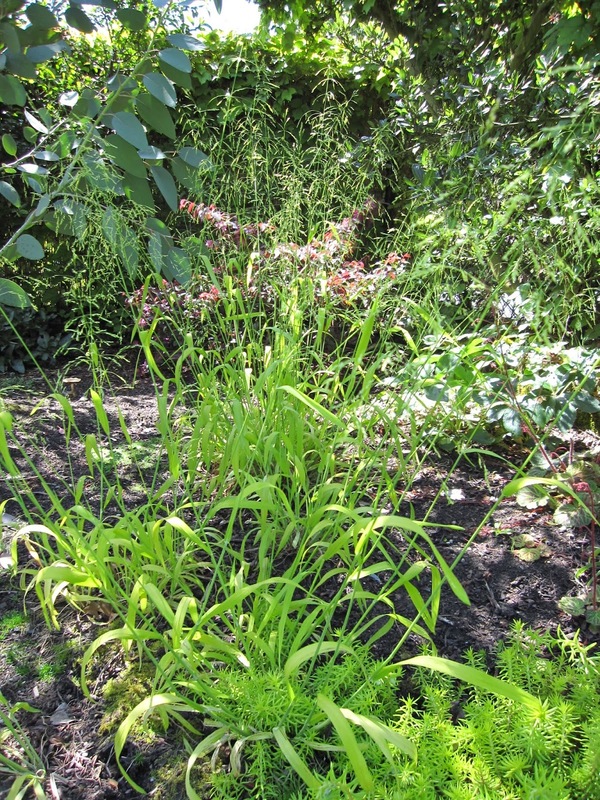 A few more of them will need to go, like the one below one snuggling into Camellia 'April Kiss' and the other menacing a young Camaecyparis thyoides 'Iceberg'. But this is definitely the year for reproduction success. From little sprouts to robust adolescents, I have plenty of volunteers. 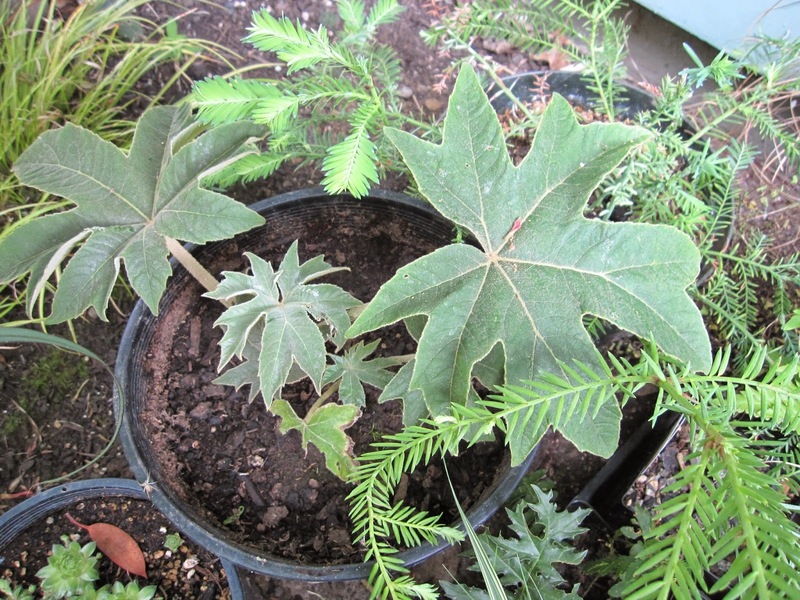 It looks like even if I decide to leave or move some around in the garden, I'm going to have lots of Tetrapanax offspring to share with locals next spring. But be warned: this could be the beginning of what will be your own Tetrapanax papyrifer 'Steroidal Giant' nursery in a just few years! All material © 2009-2014 by Jane Finch-Howell for MulchMaid. Unauthorized reproduction prohibited. It's May, it's May, the lusty month of May! This is the month that Carol, of May Dreams Gardens, and the generous host of Bloom Day, waits for all year, and we are not about to disappoint her here at Longview Ranch! So what's blooming? Well, the annual bumble-bee-feed is on at Ceanothus thyrsiflorus 'Victoria'. Ceanothus x foliosis 'Joan Mirov' in the parking strip is nicely set off by a carpet of creeping thyme. 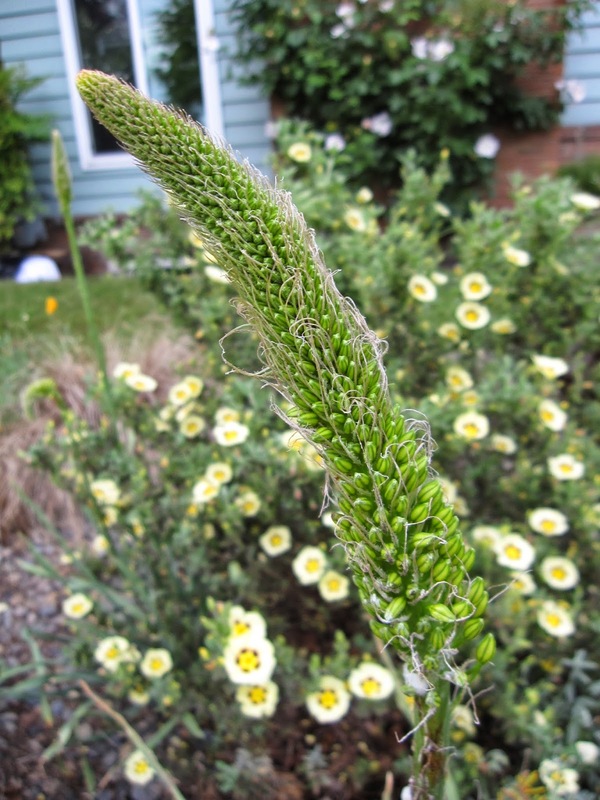 Blooming grassy plants include Milleum effusum 'Aureum', a happy self-seeder in my garden. Luzula nivea is also in bloom. Although I grow this for its shade-tolerant, year-round grassy effect, I enjoy the fluffy seed heads this time of year. Several shrubs are blooming now, like Physocarpus opulifolius 'Summer Wine'. The little trough plants are flowering as well. This is Dianthus noeanus. And here's Geranium cinereum 'Subcaulescens'. It's small but a mighty magenta! This is the month we start to get flowers named for the sun, like Helianthemum 'Cheviot'. And one of my favorites, Halmiocistus wintonensis 'Merrist Wood's Cream'. Sisyrinchiums are flowering, like S. striatum. 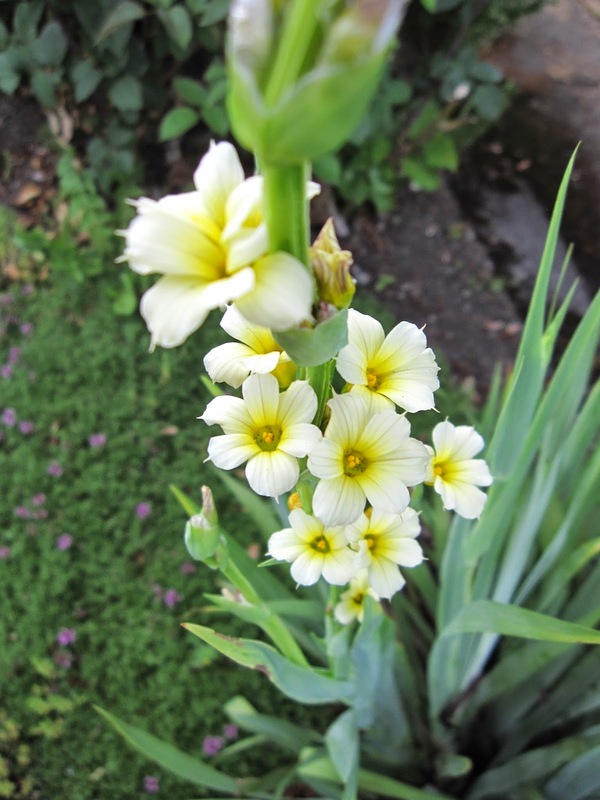 And tiny Sisyrinchium 'Devon Skies'. I shared the blooms of our Indian Paintbrush in my last post, but it's so much fun I couldn't resist showing it again. I showed a number of Pacific Coast Iris too, but here is the first Iris tenax bloom in the Northwest Territory. 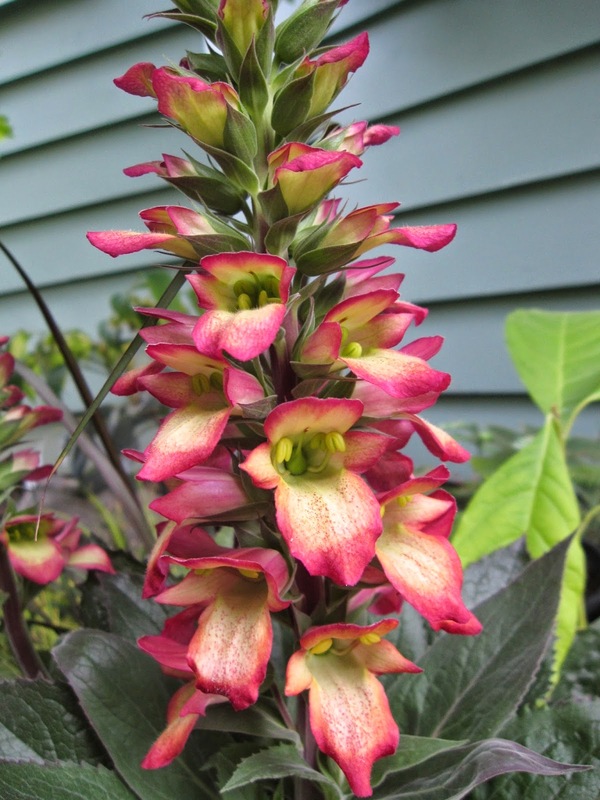 I have a soft spot for Foxgloves, so I snapped up this gorgeously-colored Digiplexus when I saw it. Last, a few "almost" flowers, in case they're not be around by the next Bloom Day. After three years, my Hesperaloe parviflora is finally going to bloom. It's sporting two flower stalks and I just couldn't pass up the opportunity to share my excitement. Also in the "This-is-great!" 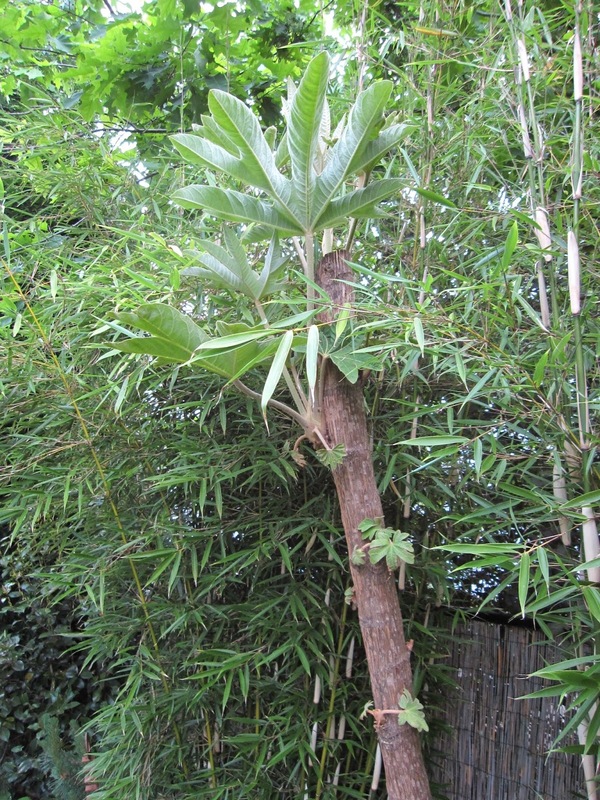 category, I have three Eremuris forming good flower heads. The biggest one has these crazy thready things all over it. Can't wait to see the flower! That's my garden this month, but Carol has much more to share over at May Dreams Gardens. Longview Ranch has two distinct garden areas in the backyard. There's the MulchMaid's eclectic, xeric and tropical south end, and there's the Mulch Man's Northwest Territory, where most of the plants are regionally native. This year, the Territory is really coming into its glory. Trees are still modestly sized, but shrubs and wildflowers are finally achieving some size and coverage. And lots of the perennials that were added over the past several years are in beautiful bloom this month. Here's Iris x pacifica 'This Ring'. Camassia quamash, flanked by the last of the Cornus 'Eddies White Wonder' blooms. The Pacific Coast irises are a beautiful mixture of subtle blue and violet tones. Penstemons in the Northwest Territory range from tiny cliff-dwellers like Penstemon rupicola, below, to big leafy ones like Penstemon speciosa that aren't yet blooming. 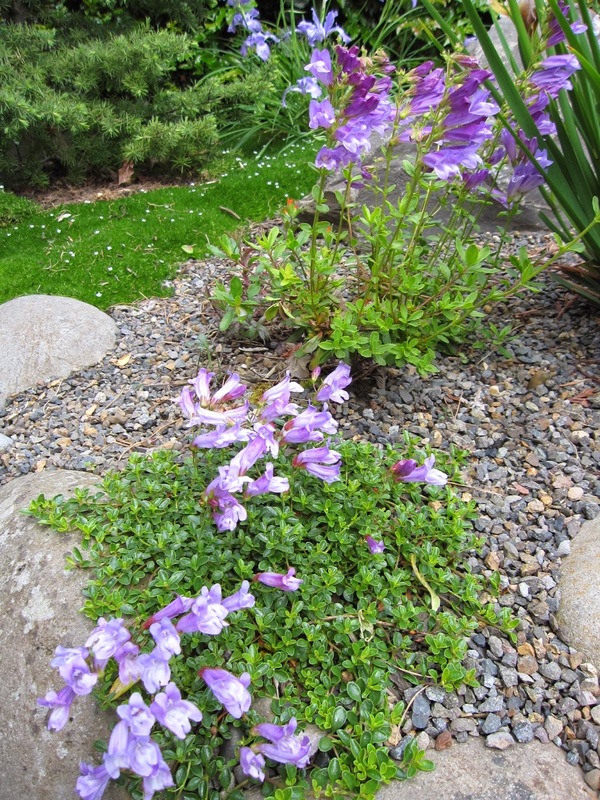 The mat-forming Penstemons look wonderful growing down over boulders, like the P. davidsonii in the lower left of this overall shot. There's a Heartleaf Buckwheat in there, too, (Eriogonum compositum) that's just about to bloom. 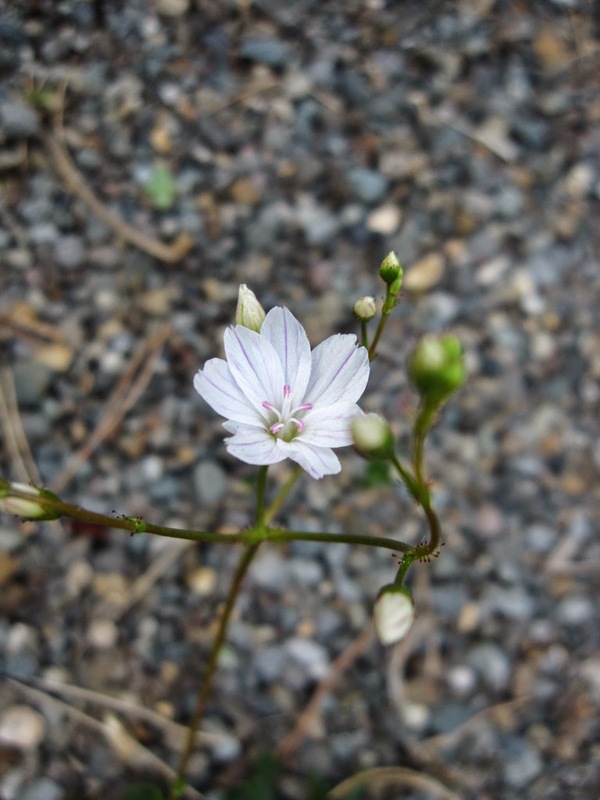 The tiny flowers of Lewisia columbiana v. rupicola, below. You can just see the plant to the middle right in the image above. 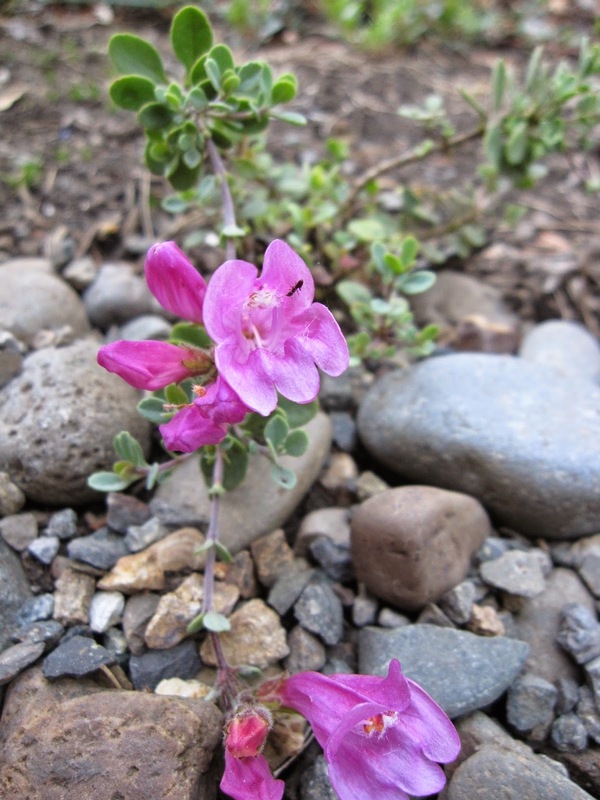 In the top half of this image is an unidentified Penstemon. It was the "companion plant" that came along when we acquired our Indian Paintbrush. And here's the Paintbrush (Castilleja species). It's little, it's red, and even though it clashes with every other bloom in this part of the garden, it's very precious. 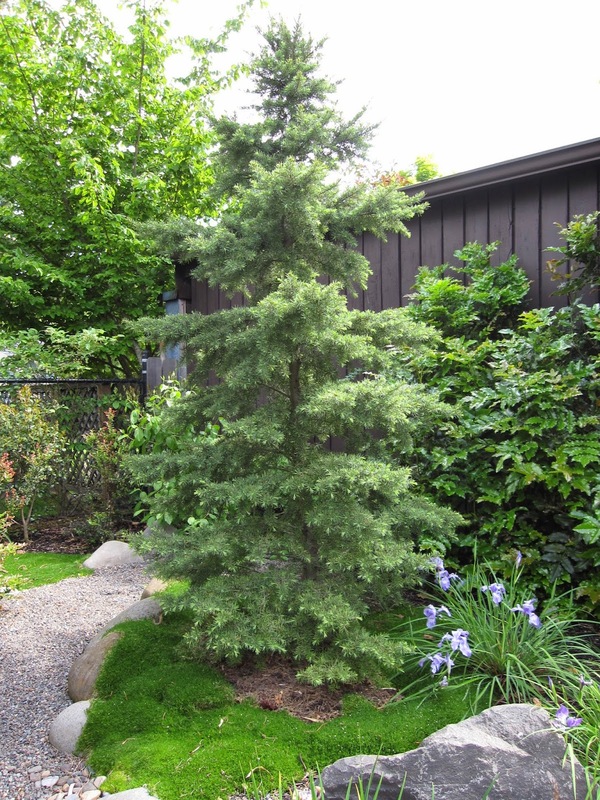 The Mountain Hemlock is a slow-grower but even if it hasn't gotten much taller, it seems to have settled in nicely and filled out a little over the past few years. Erigeron glaucus swooned every time the sun came out last year. This spring it it has been much better at handling the heat. Its blue daisy flowers will be welcome when they show up, too. The past weekend saw our first al fresco dinner this year. The Northwest Territory is finally becoming the verdant space with the privacy we sought since our move here eight years ago. 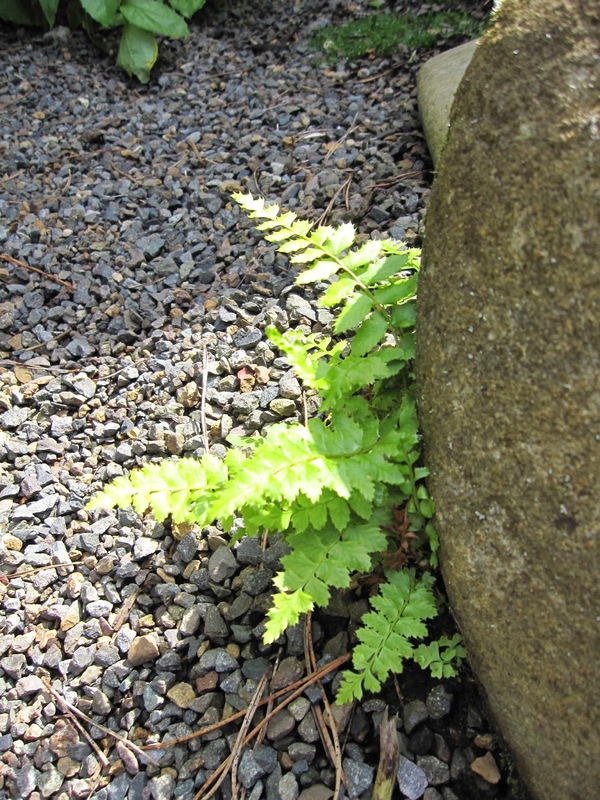 When baby sword ferns start to move in of their own accord, I think it's safe to assume you must be doing something right. Happy May from the Northwest Territory!